The Greek Isles are some of the most breathtaking and beautiful little islands anywhere in the world. Instantly recognizable with their deep blue waters, white towns, imposing cliffs, and stunning beaches, these islands of the Aegean Sea are separated from the mainland of Greece and have proven to be very popular touristic hotspots over the years. Santorini is a prime example. Classically known as Thira or Thera, this island is located in the southern part of the Aegean Sea and is part of the Cyclades islands. It's actually the southernmost member of the Cyclades and is home to around 15,000 people, covering an area of around 28 square miles in total. One of the biggest ever volcanic eruptions was witnessed at Santorini several thousand years ago, with this big event having an effect on the surrounding landscape and allegedly influencing various Greek myths and legends of the time. 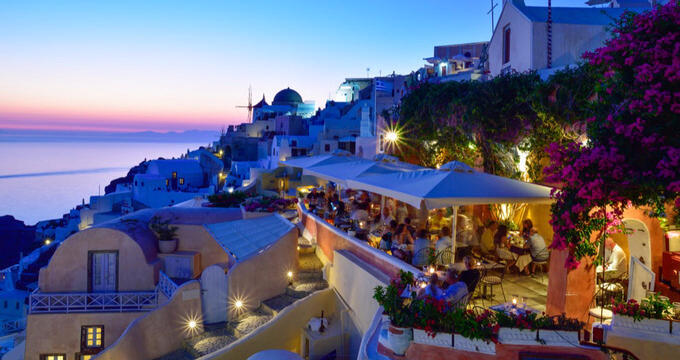 It's an island with a rich history and several major settlements including Fira, Oia, Kamari, and Emporio. Tourism is the main contributor to the economy of this Greek island, with lots of people visiting Santorini, especially in the summer, to bask on its beaches, explore its historic sites, enjoy the local cuisine, and roam the streets of the various towns. Around 2 million people head to the island each year, with some of the top spots on Santorini being the Red Beach, the Akrotiri ruins, and the wonderful white streets of places like Imerovigli. If you're heading down to this island, it's important to note that there are actually several hostels available. These places provide low cost rooms and communal facilities for all guests to enjoy, letting you stay on Santorini on a budget and potentially make friends with other travelers along the way too. Read on to learn all about a few of the top hostels of Santorini. Caveland is one of the most amazing hostel locations you could ever hope to stay in. Even if you've visited hostels all over the world in the past, you've probably never seen anywhere quite like this. This Santorini hostel, which is one of the top rated hostels on the entire island, is located just a couple of miles away from the Santorini International Airport and within walking distance of Thira and its excellent Museum of Prehistoric Thira, as well as some beautiful coastal areas, so there's a lot to do nearby. This hostel, as its name indicates, is actually set in a complex of caves that were used for wine-making several centuries ago. You'll find comfortable dorms and private rooms to choose from here, all beautifully decorated in that distinctive Greek Isle style, with lots of white, blues, and neutral tones. Guests will also be able to swim around in the on-site swimming pool, with plenty of sun loungers also spread out around the terrace to let you sit back, relax, and work on your tan. Free breakfast is provided in the cost of your room, and you can also check out the shared kitchen to make your own meals and treats throughout the day. Another highly rated hostel on the island of Santorini, Youth Hostel Anna is located in Perissa, which is down on the southeastern coast of the island and enjoys some of Santorini's best views and most amazing stretches of coastline. Some of the top things to do in this part of Santorini include visiting the Paralia Perivolos beach, admiring the marvellous black sands of the Perissa Black Sand Beach, and heading out to explore the ruins of Ancient Thera, and you can do all of that and more if you choose to stay at the Youth Hostel Anna. This hostel features simple rooms and dorms, all nicely decorated with white walls and wooden furnishings. It's a real 'home away from home' location, and this hostel also has a huge swimming pool outdoors for all the guests to enjoy as well, which is a big bonus and really makes this place feel more like a hotel than a hostel. There are plenty of communal spaces, including an outdoor dining area with lots of tables and chairs, so you'll always have somewhere to hang out with your friends and fellow travelers if you spend a few nights at this Santorini hostel. Pension Stella isn't a traditional hostel, but it does feature very low room rates and some communal spaces, so it does look and feel like a hostel and won't be unfamiliar to people who are used to staying in hostels around Europe. This hostel is situated in Karterados, only a short walk away from some of Santorini's most popular touristic landmarks and hotspots. You'll find museums, shops, bars, and eateries all within 5-10 minutes of this location, so there's lots to do in the area to fill up your days and ensure you never have to feel bored. What's more, the fine folks at the Pension Stella actually provide a free shuttle bus service to take you around the local area, stopping at various landmarks and locations along the way, making exploration even easier than you could ever imagine. Like the other Santorini hostels on our list, the Pension Stella features its own outdoor pool with sun loungers and umbrellas by the side of it. Guests will also be able to enjoy clean bathrooms and cozy rooms at this location.